I'm not usually one for a midi, nor am I really that into bodycon but I loved the style and the material of this long sleeve marl dress from Primark. It's quite thin and therefore very unforgiving I have to say, but with a good pair of tights to hold everything in it makes for a nice transition between a winter outfit and something for the warmer weather now we've got a bit more sun. I often wonder if I'm boring you with my endless Primarni outfits (and slight addiction) but it's pretty much the first place I seem to head these days! 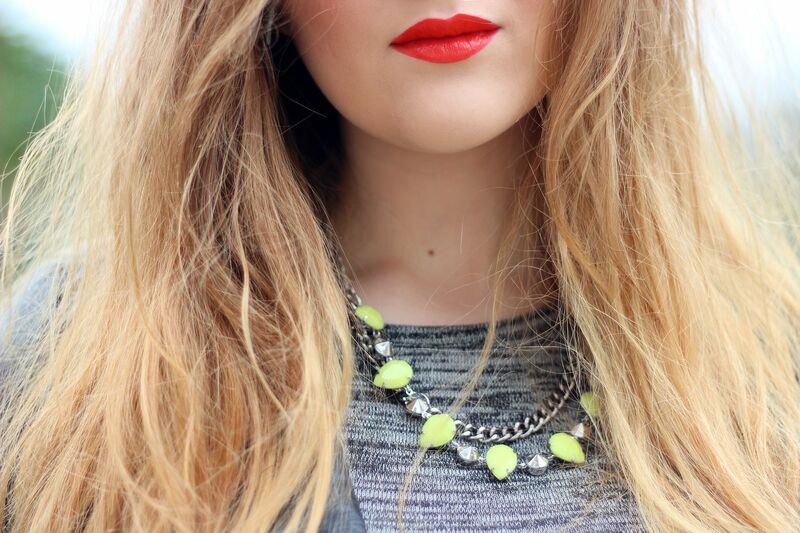 I'm also loving adding a touch of neon to monochrome outfits with this H&M necklace (and red lips of course). I find it pretty hilarious that a few years ago I would have looked at this combo of neon plastic and studded rhinestones and absolutely gagged, and yet now I love it. How times (and fashions) change!